Food Lion President Meg Ham is The Shelby Report’s Southeast Woman Executive of the Year for 2017. Ham will celebrate 30 years with Food Lion’s parent company, Delhaize America (now part of Ahold Delhaize) next year. 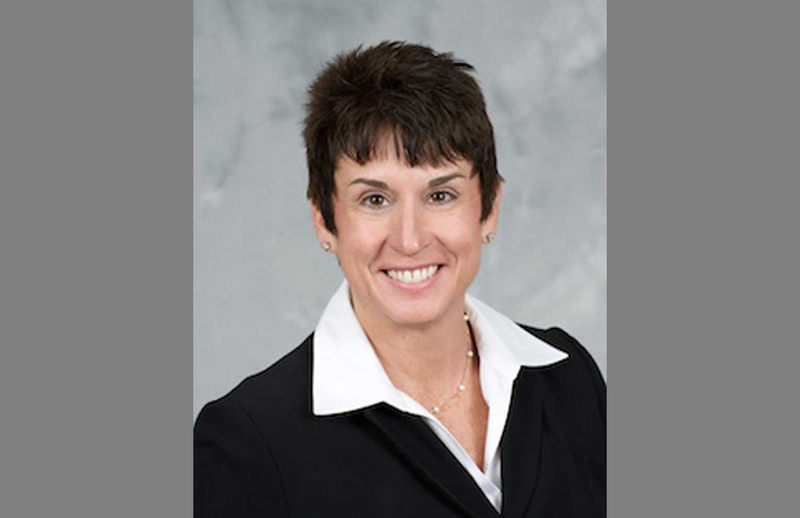 She joined the company in 1988 and has held a range of leadership roles at both Food Lion and Maine-based Hannaford. Before becoming president of Food Lion on Nov. 1, 2014, she was president of Bottom Dollar Food, a discount banner Delhaize sold to Aldi shortly after naming Ham to lead Food Lion. At the Salisbury, North Carolina-based chain that operates more than 1,000 stores in 10 Southeastern and Mid-Atlantic states and employs more than 63,000 associates, she leads all operations, including strategic direction, financial performance, product assortment, pricing, customer service and marketing. Ham has a reputation of being a servant leader, and that extends not only to the way she interacts with her associates at Food Lion but also the chain’s shoppers and the communities the stores operate in, as you’ll see in the Q&A below. For her nearly three decades of service to the industry and the example she sets for others, we are pleased to honor Meg Ham as our Southeast Woman Executive of the Year. Being at the helm of Food Lion for about three years, what changes/improvements are you most proud of? Associates, operations, customer engagement, community engagement? This work includes remodeling more than half of our stores in the network to make shopping easier for our customers as well as making sure we transform the shopping experience of our customers and ensuring they know Food Lion is a neighbor they can count on! At Food Lion, we like to say we are the towns and cities we serve, and I strongly believe nourishing, caring for and feeding our communities is something we are deeply passionate about and will help us build deeper emotional connections with our customers. I’m also very proud of our associates who have embraced our new culture and the care for our customers as well as our commitment to donate 500 million meals by the end of 2020 through Food Lion Feeds and, to date, we’ve donated more than 330 million meals. Humble is a word that has been used to describe your management style. How do you think that developed? Was it your upbringing, mentors, experience, education? I come from a family of strong women leaders who were excellent examples for me, and I learned from some of the most humble leaders I know. My mother led our household, and my grandmother was a widow who put four children through college, despite her twins being born during the Great Depression. I try to emulate my mother and grandmother for my family, which includes my loving husband and two wonderful boys, 18 and 14 years old. What are some of the reasons Food Lion has achieved 60 years in the highly competitive grocery business? First and foremost, we wouldn’t be where we are today without our loyal and dedicated associates who make sure they serve our customers well every day and keep them coming back to our stores for all of their grocery needs. I’m always so amazed at our associates who have spent decades working for our company and who are so dedicated to making sure our customers can always count on Food Lion. Whether it’s an associate who has worked for us for 50 years or one who has been here only a few short months, our associates are very near and dear to me and are very special! I also believe our tenacity and focus over the years has ensured—and will continue to ensure—that we will be around for another 60 years! From always being focused on the customer to ensuring we maintain our low price heritage so our customers can nourish their families with fresh and affordable food is very important in the towns and cities we serve. We know many of our customers make tough choices every day, and we want to make those choices easier because people can afford to eat healthy by shopping at Food Lion. Consumers these days, especially younger ones, like to support companies that are active participants in their communities, that use their business for “good.” Food Lion has been impacting hunger in communities through the “Food Lion Feeds” initiative, for example. Are there other causes Food Lion embraces? Tell us about those. Are there intangible benefits that go along with these efforts, such as company (associate) pride? Meg Ham, left, with Food Lion volunteers doing pantry makeovers for food banks as part of Food Lion Feeds. In addition to hunger relief, Food Lion is committed to the towns and cities it serves through disaster relief, sustainability and support of armed forces and veterans. Food Lion is there for its communities in times of need, particularly when disaster strikes. Whether it was Hurricane Hugo in 1989 or Hurricane Matthew in 2016, Food Lion was there with food and water. From hurricanes and tornadoes to wildfires and droughts, Food Lion understands communities rely on the company to be there in times of need and takes that responsibility very seriously. Food Lion is grateful to the men and women who risk their lives to serve our country every day. The company supports local military personnel—active, retired and reserve—near military bases in the states in which we operate. On Memorial Day and Veterans Day, active and retired military personnel receive 10 percent off their entire purchase. Food Lion’s commitment to the environment is far-reaching. For one, we are committed to energy savings. We are the only grocer to win the Energy Star Partner Award from the United States Environmental Protection Agency (EPA) 16 years in a row; we have several LEED-certified stores; and we recycle or repurpose cardboard at our stores, corporate offices and distribution centers. In 2016 alone, Food Lion recycled more than 115,000 pounds of cardboard. What excites you about Food Lion’s future? I’m extremely proud of the solid foundation we have established over the past 60 years and, in more recent years, understanding the needs and wants of our customers. From working to help our customers connect emotionally to our brand through the culture of “Count on me,” personalization of savings at Food Lion and care we extend to our communities, to the changes we’ve made in stores or through product expansion, it’s these actions that will enable us to be nimble and flexible and still be here for another 60 years. And, while Food Lion is evolving the grocery experience for its customers through digital and e-commerce innovation, we also continue to reinforce our care for our communities and tell our story of how we are making groceries more affordable for them. And this can be done in many ways. Whether it’s refining the products we carry in our stores to meet changing customer preferences such as more organic and natural products, or craft beers and expanded wine or enhanced home meal solutions, to further enhancing the freshness of our produce so it lasts longer at home, or continuing to invest in prices to ensure we maintain our affordability position among increased low-price competitors—all of these efforts showcase our desire to care for customers as we help them save money and nourish their families with healthy meals. For me, it’s the same as above. It’s Food Lion’s growth and ability to make deeper connections to our customers. I’m very excited about the future and look forward to continuing to grow our business for another 60 years! What advice would you give young women who aspire to run a grocery chain someday? I like to think about this as advice I’d give to anyone who aspires to continue to grow in their leadership with the company. First, responsibility and accountability are big for me, and I believe everyone has to own their own personal development and their own leadership. Growing up, my mother had a quote on a card—10 two-letter words to live by—that she often shared with us: “If it is to be, it is up to me” (author unknown). These have driven me throughout my career, and I believe they can be helpful to others, too. 1957: Brothers Brown and Ralph Ketner, along with Wilson Smith, open the first Food Town on Dec. 12 in Salisbury, North Carolina. The three raise money to open the store by going through the local phone book asking for $10 investments. There are 122 investors contributing $67,500; the three co-founders personally invest enough to raise a total of $125,000. Food Town is one of the largest stores in the area, with more than 15,000 s.f. of sales floor space. 1967: Ralph Ketner locks himself in a motel room for three days with six months of invoices and an adding machine in order to slash prices on 3,000 items by 10 percent. If sales volume increased by 50 percent, Food Town would show a profit. His implementation of the volume concept is a game-changer for the grocery industry. 1968: Food Town launches its “Lowest Food Prices in North Carolina” slogan, which becomes popularly known as LFPINC. Volume is key. 1970: Food Town shares are listed on the over-the-counter system of NASDAQ. 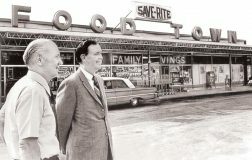 Tom E. Smith, who had first worked at Food Town as a bagger in 1957 when he was a junior in high school and then as a store manager, rejoins Food Town from Del Monte, as a buyer. Smith is offered the first-ever stock option in the company. 1974: Belgian company Delhaize “Le Lion” acquires minority ownership of 34.5 percent in Food Town stores. 1977: Food Town adds a lion to its logo. 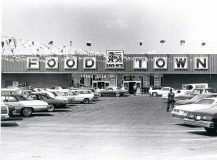 1980: From 1968-80, Food Town sales grow from $8.5 million to $543 million. 1981: Tom Smith is named president; he would add the CEO title in 1986. He carries forward the principles of low prices and efficient service in the stores. 1982: In its 25th anniversary year, Food Town is named “Fastest growing supermarket chain in America” by Forbes magazine. 1983: Food Town changes its name to Food Lion—having to change only two letters on its store signs—and Food Lion reaches $1 billion in sales. 1985: Ralph Ketner retires from Food Lion. Food Lion acquires Giant Food Markets Inc. of Kingsport, Tennessee. 1987: Food Lion expands into fast-growing Florida, opening three stores in the Jacksonville area and formulating plans for 20 more plus a distribution center. 1988: Many Food Lion investors become millionaires. 1990: Food Lion begins testing new concepts, including different size store formats. Sales reach $5.6 billion. The company’s expansion that began in the 1980s, starting with South Carolina and Virginia, has given Food Lion a presence in Georgia, Tennessee, Maryland, Florida, Delaware, Kentucky, West Virginia, Pennsylvania, Oklahoma, Louisiana and, now, Texas. The company has been adding approximately 100 supermarkets per year during this period. 1994: Food Lion closes 84 stores in Texas, Florida, Louisiana and Oklahoma due to underperformance. The chain opens only 47 new stores this year. 1996: Food Lion acquires the Kash ’n Karry chain based in Florida, adding nearly 100 stores. 1999: Tom Smith retires as president and CEO. 2004: Continuing to experiment with store formats, Food Lion opens first Bloom store in Charlotte, North Carolina. The store design puts everyday items like milk, bread, eggs and home meal solutions near the front of the store; frozen foods are located near the checkout area; and HBC products are next to the pharmacy. Customers also have the option of picking up a personal scanner that allows them to scan and bag their items as they shop. Food Lion begins a campaign of renewing stores in select markets. 2005: Food Lion opens its first Bottom Dollar Food stores in High Point, Asheboro and Mt. Airy, North Carolina. Bottom Dollar sells both private brands and national brands at discount prices as well as produce and meat. 2007: Food Lion unveils a new logo during its 50th anniversary year. Cathy Green Burns is named to lead Food Lion. She had begun her career as a bagger at a Hannaford store while in high school. She rose to VP at Hannaford before joining Food Lion in 2002. 2012: Food Lion closes 126 underperforming stores. Some Bloom and Bottom Dollar Food stores converted to Food Lion. Beth Newlands Campbell, a 25-year company veteran of Hannaford and Food Lion, is named president of Food Lion, succeeding Cathy Burns. 2013: Food Lion launches new store format in Concord, North Carolina, including Food Lion’s first walk-in produce cooler. 2014: Food Lion unveiled its new chainwide strategy: “Easy, Fresh and Affordable…You Can Count on Food Lion Every Day!” complete with a new logo. In addition, the company completes remodels on 76 stores in Wilmington and Greenville, North Carolina. Food Lion Feeds is created to focus company’s philanthropic efforts solely on hunger relief. Company commits to donating 500 million meals by 2020. Beth Newlands Campbell steps down as president as of Nov. 1; she is succeeded by Meg Ham. 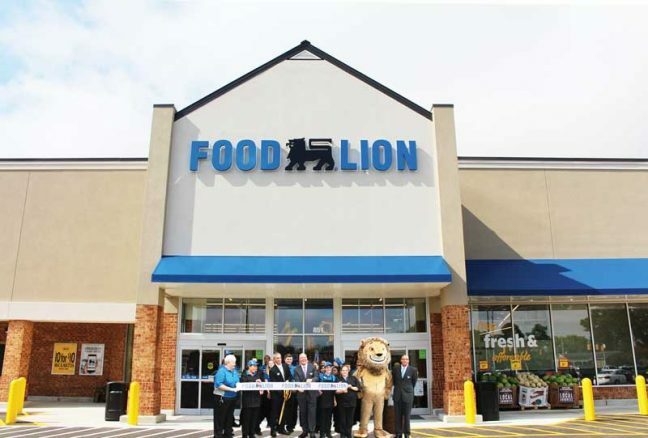 2015: Food Lion remodels 162 Raleigh, North Carolina, area stores. 2016: Food Lion remodels 142 Charlotte, North Carolina, area stores, and 61 Food Lion stores are divested as part of the Ahold Delhaize merger. 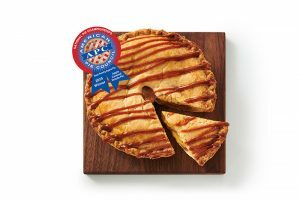 2017: Food Lion celebrates its 60th anniversary. In addition, remodels are completed in 93 Greensboro, North Carolina, area stores and 71 Richmond, Virginia, area stores. Easy, Fresh And Affordable: What Does It Really Mean? Today, “Food Lion stores feature easy-to-navigate aisles, expanded assortment across all departments with items neatly organized to enable an easy-to-shop experience, along with conveniences such as grab-and-go meals and daily meal solutions. Friendly associates ensure each customer is greeted with a ‘Count on me’ attitude,” the company says. In addition, Food Lion’s mobile app gives shoppers access to their digital MVP card, loadable coupons, digital shopping lists (which identify items down to the aisle in their particular store) and more. Food Lion also is piloting home grocery delivery and grocery pickup through Food Lion To-Go in select markets, including Charlotte, North Carolina. Food Lion is piloting a new personalized loyalty program offering customers monthly rewards on products and categories they shop the most. Through its private brand line, Nature’s Place, Food Lion has more than 400 natural and organic items, including Nature’s Place beef, pork, poultry, salads and bakery items. Easy, Fresh and Affordable: What Does It Really Mean? From the beginning, the company has strived to offer the best price to customers and to “compete mightily over price with competitors,” it says. As Co-Founder Ralph Ketner used to say, “When we save, you save.” He came up with the acronym LFPINC to assure customers they would find the Lowest Food Prices in North Carolina at Food Town (the predecessor banner to Food Lion). Hot Sale: Food Lion’s top weekly MVP specials, and the best prices throughout the store, only available with an MVP card. WOW: Lower prices on thousands of items, offered for longer periods of time. Low Price: Essential items priced affordably every day. 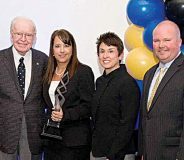 Ralph Ketner with 2014 Store Manager of the Year award winner, Rhonda Mauldin, Food Lion store manager in Simpsonville, South Carolina; Meg Ham, Food Lion president, and Greg Finchum, Food Lion SVP of retail operations. On two occasions, Mr. Ketner granted extensive face-to-face interviews to Shelby Report President and Publisher Ron Johnston; in 1998 and then in March 2016, shortly before Mr. Ketner’s death on May 29 at the age of 95. He had been the last of Food Lion’s founders still living. Mr. Ketner and his brother, Brown, teamed up with friend Wilson Smith to open a Food Town store in Salisbury, North Carolina, in 1957. Brown and Ralph’s father had been a farmer, butcher and grocer, so the boys knew some about the business, and they worked for their older brother, Glenn, at his store—Ketner’s—when they were teenagers prior to opening their own store. Ralph retired from Food Lion in 1985, but his legacy lives on in many ways, including The Ralph W. Ketner Store Manager Excellence Awards that the company now presents each year. The awards are given to exceptional store managers who “enrich the lives of customers, associates and communities, successfully leading the business and supporting and inspiring others.” Divisional winners are named, as well as a Store Manager of the Year. Food Lion partnered with Catawba College and Mr. Ketner to produce “Lessons in Leadership,” a documentary film featuring the life and business lessons students and professionals can learn from Ralph W. Ketner. Food Lion President Meg Ham holds the official award after Food Lion set its Guinness World Record. An official Guinness adjudicator verified the count. This effort was part of Food Lion’s 60th anniversary celebration and the company’s commitment to eliminate hunger through Food Lion Feeds, its hunger-relief initiative. 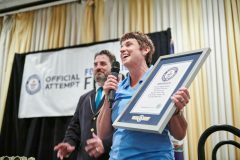 Through its Guinness World Record title win, Food Lion achieved bringing awareness to Hunger Action Month while donating the lunches to local food banks. The bagged lunches were donated to two local food banks—the Blue Ridge Area Food Bank and Feeding America Southwest Virginia—which distributed them to local schools and others in need within the Hot Springs community. Editor’s note: The full special section honoring Meg Ham and Food Lion can be seen in the December 2017 edition of The Shelby Report of the Southeast.